As a newlywed, I was gifted with a set of cast iron skillets. They lasted a few nightmarish months before I got rid of them in a garage sale. They were impossibly heavy. Everything I cooked stuck to the inside of those pots, and no amount of soaking or scrubbing could possibly get them clean. Three days in the sink and I still had to attack the burnt solidified remains out of my pots with a screwdriver and hammer. I hated those pans and held a party when they went home a very happy old lady. 30 years later I’m that old lady. In 2001 my husband and I decided to buy an RV and travel the country. I had to slim down my extensive cookware collection to a few essential pieces, with the understanding they would be used inside the RV and at a variety of outdoor campsites. The experts all agreed, cast iron was the way to go. I decided to give it another try. Once I learned how to season my cast iron cookware properly, I fell in love. Cast iron is as stick free as teflon, it gave me crispy fried chicken and seared meats, it cooked evenly without burnt spots, it worked well at lower temperatures and held the heat, keeping our meals warm for a very long time. I could cook it over an open flame or in my oven, if I put the lid on I could even bury it in a campfire. Best of all, I only needed three pieces: a large skillet, a dutch oven, and a griddle, to provide my family with healthful delicious meals while on the road. My Lodge Logic 12-Inch Pre-Seasoned Skillet is one of my favorite pans. It is my go-to pan for cooking bacon, sausage, ham slices, or frying up large fritatas. I love it for making hash browns, home fries, and it produces cornbread with perfectly browned edges in my oven. If you only have the budget to purchase one pan, this would be it. Priced at around $22 in retail stores you can often find this large skillet at garage sales and stores such as GoodWill or Salvation Army. Click on the image to read reviews and purchase through Amazon. The Lodge Logic Dutch Oven with Loop Handles will handle all manner of large dishes. It is big enough to handle soups and stews, simmer a pot of spaghetti sauce or chili (some people find a metallic taste from cooking in cast iron. I wipe my pots down with a thin layer of olive oil and never noticed a problem). I deep fry, and often use my pot for baked beans, and it works like a dream for no-knead bread. You want to season this pot very well and keep it seasoned to counteract the effect of those long slow simmer times. Click on the image to read reviews and purchase through Amazon. The Lodge Logic Pro 20-by-10-7/16-Inch Cast-Iron Grill/Griddle is a flat griddle on one side with a grill on the other side. Keep it on the stove all day for pancakes, french toast, crispy bacon, and breakfast sausage in the morning, panini or croque monsieurs for lunch, and at the end of the day, use it for perfect pan seared veggies, steaks, chicken or fish. Click on the image to read reviews and purchase through Amazon. Once I moved back into a house I added to my collection - a chef's skillet, which I use as an omelette pan, the ever handy 8" skillet, and a flat griddle pan for roti and small tortillas. We eat a lot of omelettes, usually loaded with any number of creative combinations of diced up veggies, meat and cheese. They are an entire meal unto themselves, and we serve them for Sunday breakfast, a quick and easy lunch, or a relaxed dinner with a salad. The Lodge Logic 10-Inch Chef's Skillet is gently rounded at the edges, allowing you to slide your spatula underneath to fold without tearing. Also ideal for stir fries, the Lodge Logic 10-Inch Chef's Skillet is a wonderful addition to the basic frugal kitchen. Click on the image to read reviews and purchase through Amazon. The Lodge Logic Pre-Seasoned Cast-Iron 8-Inch Skillet is perfect for when you are making meals for one or two and don't want to bring out the large cast iron skillet. It is just the right size for that grilled cheese sandwich, two skinless chicken breasts, or a hamburger. The Lodge Logic Pre-Seasoned Cast-Iron 8-Inch Skillet is one of the most used pans in my household and I am sure it will be the same in yours too. Click on the image to read reviews and purchase through Amazon. If you love tortillas, quesadillas, or roti, you will find the Lodge Logic Pre-Seasoned 10-1/2-Inch Round Griddle the ideal addition to your kitchen. The even heating and heat retention properties are favorites of the ethnic cook, while the flat surface and easy access low sides let you flip the contents with ease. Click on the image to read reviews and purchase through Amazon. The Lodge Logic Pre-Seasoned Straight-sided Muffin/Cornbread Pan is the secret behind deliciously moist yet sweet crusted muffins and cornbread Click on the image to read reviews and purchase through Amazon. Your quick breads, meatloaf, and grits loaf will be spectacular using the Sante Cabin Kitchen Cast Iron Bread Pan Try our recipe for Best Banana Bread in a cast iron loaf pan. Yummy! Click on the image to read reviews and purchase through Amazon. Yearning for good old fashioned Southern drop biscuits? You'll never have a meal without them again, once you try the Lodge Logic Pre-Seasoned Drop Biscuit Pan. Click on the image to read reviews and purchase through Amazon. One of my favorites is the Lodge Logic Cornstick Pan. You can mix your own batter or use a Jiffy mix to create delicious corn sticks. Try adding a few drops of hot sauce, or a bit of canned creamed corn or Rotelle tomatoes and green chilis to the recipe to give it an extra kick. Click on the image to read reviews and purchase through Amazon. Want to know the secret to amazing Southern Fried Chicken? It's right here - the Lodge Logic Pre-Seasoned 5-Quart Chicken Fryer with Iron Cover! The heat retention of cast iron allows you to seal the moist chicken inside a crispy crust. We'll leave the seasoning to you! Click on the image to read reviews and purchase through Amazon. No campfire is complete without a Lodge Logic Pre-Seasoned 10-Quart Deep Camp Dutch Oven with Iron Lid resting in the embers - especially if you are a Scout. Check our recipe section and links for an endless variety of delicious campfire dutch oven recipes. Click on the image to read reviews and purchase through Amazon. You will not only be able to cook like a pro, with minimum care you can proudly pass your collection on to your children and grandchildren. THAT's Frugal! Good quality cast iron is not being made any more. At one time, cast iron cookware was plentiful and made to very high standards. That is no longer true. The best available NEW cast iron, is Lodge. But even Lodge changed its manufacturing process in the 1960's. If you want the BEST cast iron, go to garage sales. Cast iron is ageless. Properly cared for it can be passed down from generation to generation, improving with use. Look for pieces grandma used - pieces from the 1950's and before. There were many excellent foundries in the US, producing high quality cast iron cookware until well after WWII. Many bear no maker's mark. If you find Griswald or Wagner, grab them. They are the best of the best. But don't despair if you can't find pre-1960 cast iron. Lodge is perfectly serviceable. I seasoned mine, and use it every day. My 8" Lodge pan cooks my eggs in the morning, my 10" skillet is my favorite for cornbread, and I deep fry and cook my curries in my dutch oven. They are the same pieces I show above. I rinse the pots out with my other dishes - nothing special, and just wipe with olive oil before I put it away. Avoid CHEAP cast iron. China has been taking scrap iron, including motors, and melting them down to make cast iron cookware. YUCK. Aside from the yuck factor, the cast iron is filled with impurities that may cause it to warp, crack or break. Wherever you find the best deal! First, ask your contacts if they have any unused cast iron cookware. You'll find downsizing relatives and friends often have extra pieces that will get you started. Garage sales are great. When I first learned to cook I was told cast iron was the best but I didn't know how to use it or care for it and eventually I sold it at a garage sale. The world is full of people like me, who cook in unseasoned pots expecting them to behave like teflon. Their loss is your gain. Check Craigslist and put out a request on Freecycle. 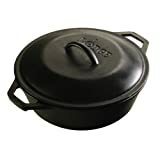 Amazon is a great place to buy cast iron IF you have a Prime membership and the piece qualifies for free shipping. 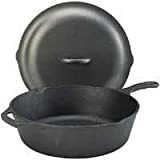 At this writing Amazon prices for cast iron cookware are the same as, or very close to, retail Mart type stores. People avoid cast iron because they think it takes too much work. Not true! There’s a very simple trick to using cast iron successfully. Cast iron needs to be “seasoned” when new, and kept seasoned during its lifetime. Seasoning is nothing more than building up thin layers of oil coating on the inside of the pan to create a smooth slick cooking surface so your foods don’t stick. Seasoning will also prevent your cast iron from rusting. DO NOT cook in your new pan and expect it to be non stick. Food WILL stick to a new pan. Use your new pan for frying - fry bacon, french fries, deep fry chicken. Remove the food, wipe down with a paper towel, and let the pan sit in a warm oven for two hours. Do this a few times. Or if you don't like fried food, wipe down with lard or grapeseed oil, and let sit in a warm oven. You want to build up several THIN layers of oil. Once the pan is well seasoned nothing will stick. After that, whenever you use your pan, clean it and wipe down with a thin coat of olive or grapeseed oil. Dave from davecancook.com has an excellent video that shows exactly how to season your new cast iron pans. In order to preserve the seasoning you've built up you want to be gentle with your cast iron cookware. Soak in warm water, loosen stuck on bits with a wooden spoon, and use soft sponges and scrubbies. Avoid using detergent which will break down the seasoned coating. You can use a little liquid soap but stay away from harsh powdered cleansers - and never put your cast iron cookware in the dishwasher. Hand wash and dry immediately and completely with a dishtowel to avoid rust. Wipe the inside with a thin coating of vegetable or olive oil. Re-season as needed, depending on use. Iron is strong. You can put anything on top of it - like burnt on food, or rust, or soot or thick grease. But underneath that cast iron is as good as day one. There are a variety of cleaning methods, most using a lot of elbow grease and caustic chemicals, to get cast iron looking good again. Usually a good soak in heavy duty oven cleaner and scrub with a metal brush will do the job. Be sure to season your pot as if it was new after any good scrubbing or heavy duty cleaning. While placing your dutch oven into embers is okay, never put cast iron directly into hot flames or an oven on the cleaning cycle. Some recommend this to burn off crusted foods, but such excessive heat can cause your cast iron to warp, crack or bloom - it will get a rosy shadow that you cannot remove. Every piece of cast iron lost to misuse is a piece we cannot pass on to the next generation. Cast iron will leech a minute amount of iron into your food. This will help prevent anemia, especially in women of childbearing age. However, elderly people should not eat a lot of food cooked in cast iron as recent studies show many older people already have too much iron in their systems. Cast iron is HEAVY. It weighs a lot. Those who do not have a lot of strength in their arms may find cast iron too heavy to be practical. Even the well muscled amongst us may want to avoid very large items such as roasters and soup pots that are made out of cast iron or porcelain coated cast iron. Because the cost of shipping heavy items is high, you may want to purchase your items locally or through online retailers that do not charge shipping. Amazon Prime has two day free shipping which is perfect for cast iron and other heavy items such as case lots of canned goods. Lodge Manufacturing Co, founded in 1896, is the only remaining foundry producing cast iron cookware in the USA. Lodge Cast Iron manufacturer's instructions for using, cleaning and re-seasoning your cast iron cookware. An excellent resource telling you how to season, use, and clean cast iron pans. Also, how to fit lids. Sales site for seasoned, ready to use, American made Lodge Cast Iron Cookware. Dutch ovens, griddles, grills & skillets. Also, accessories, lids, outdoor use, and recipes. Sales site for Lodge Cast Iron Cookware. Cast iron skillets, Dutch Ovens, cast iron grill pans and griddles. They also carry Olvida Nickel Plated Cast Iron. Sales site with instructions on seasoning, caring for, and re-seasoning cast iron cookware to produce a non stick suface. Sales site for Lodge Cast Iron Cookware. Save on dutch ovens, fryers, grills, and skillets for home and outdoor use. Amazon Lodge Cast Iron Store. Save on Lodge cookware, specials, and free shipping with Prime. GCICA The official club for those collecting Griswold, Wagner, Erie, Piqua, Wapak, John Wright, Lodge, Sidney Hollowware, and other iron or aluminum cookware. Instructions on salvaging and seasoning old cast iron cookware. Wikipedia entry on the pros and cons of cooking with cast iron. Article about the benefits of cooking with cast iron cookware. If you want really crispy southern fried chicken you have to use a big, deep cast iron frying pan. This is one of the best cast iron pages on the web. Good job!